This year, for Memorial Day weekend, the Wife and I went to the In-Laws lake house on Lake Cornelia to remember the Wife's Uncle Tom who passed earlier this year after a short battle with cancer. 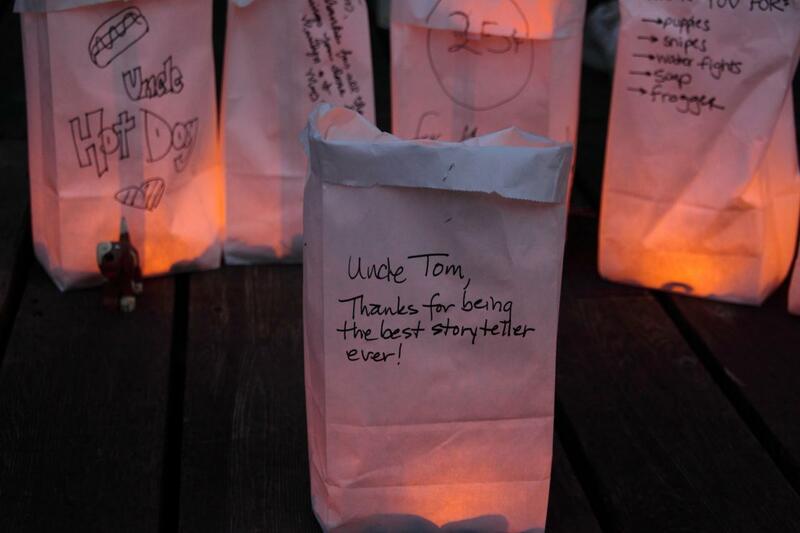 Luminaries were handed out and people wrote their favorite memories about Uncle Tom. Luminaries were also passed around to other residents of the lake who knew Uncle Tom. At 9:30 PM everyone lit the candles and remember a great man. My memories of Uncle Tom match those of the Wife. He was a master storyteller who could weave the tallest of tales. As he told his stories you wouldn't know if what he said was true or not until, at the very end, he would crack a little smile and give you a wink. The Wife's, and My, Memory of Uncle Tom. On this day of remembrance, we remember Uncle Tom and all the Men and Women who have given their lives for our country. Their stories will live on in our memories. What a fantastic way to honor the memory of a loved one! Miss McC: You are very welcome.